Author of dark fiction and fantasy, dystopia, horror. For interview #30 we have an author and an award-winning poet whose interests include mythology, steam power, and fountain pens. Good people of the Internet, writing out of Minneapolis – CW Hawes. This was a very difficult question! I came up with 15 books and didn’t even have to think about the question. The one I decided on (today, because tomorrow the choice might be different) is Wingman by Daniel Pinkwater. The book is for kids (about ages 8-11), but there is plenty of depth to it to make it a satisfying read for adults. It is one of my all time favorites. The message is simple and positive. The storytelling is superb. Pinkwater’s illustrations are a definite bonus. What I found interesting is that the book is very different from Pinkwater’s other books. And while I very my much like Pinkwater (must be the kid in me), I think Wingman is his very best. I’m not going to say much more because everyone really needs to read this book. Wingman just may change your life. Many of your interviewees cite Weir’s The Martian. I’ve never read the book. I have read The Martian Chronicles by Ray Bradbury and Men, Martians, and Machines by Eric Frank Russell, which probably betrays my age. I’d love to take my iPad, but that probably doesn’t qualify as a book. And then there’d be the problem of recharging it. So if I have to stick with paper, and assuming the book was to provide me with entertainment and solace, something to occupy my time during the long Martian winter, I’d take Saigyō, Poems of a Mountain Home, translated by Burton Watson. Saigyō was a 12th century Japanese poet. We know little about him. He began adult life as a member of the Emperor’s elite guard and while still a young man left the guard to become a Buddhist monk. His poetry is simple and yet profound and will stand re-reading and contemplation for many, many of those long Martian winters. Quite honestly, I find myself more often disappointed than surprised when I pick up a book these days. I love the indie movement. I love the fact anyone who wants to do so can publish a book. There should be no gatekeepers. Which, of course, means I become the gatekeeper and must sift my way through the chaff looking for the wheat. However, the big corporate publishing houses are no better. They publish a surprising amount of banal and even bad books. And they have gatekeepers. Go figure. Of course their gatekeepers are there to make sure the publishing houses make money, not to make sure the book is of quality. Nevertheless, gems are to be found. Wonderful gems. This is a great day for readers. One book I took a chance on simply because I liked the title was The Succubus in a Red Dress by Daniel David Garcia. And I’m glad I did. The book isn’t at all my normal cup of tea. However, the characters are delightful, there is humor galore, and Mr Garcia knows how to tell a story. I enjoyed the book so much, I’ll probably pony up the bucks to buy the rest of the series. I like all of my books and stories. And I love most of them. I write what I want to read and am generally pleased with the result. But if I had to pick one as my favorite it would be Festival of Death. It was the first novel I wrote. Then 25 years later I rewrote it and published it. I love the characters, especially the main ones: Tina and her brother, Harry. And I love watching them grow with each successive book and story. Festival of Death came about because I wanted to write a mystery and at the same time discovered there are caves beneath the city of Minneapolis, Minnesota. Now how cool is that? And toss in a neo-Aztec cult and homeless people and… Let’s just say I had a blast writing the story. The book is available exclusively through Amazon. Which means Kindle Unlimited folks get to read for free. This one is easy. Seneca’s Letters to Lucilius. Lucius Annaeus Seneca was a Roman statesman and Stoic philosopher. Perhaps most noted for being one of Nero’s tutors. At the height of his political power and influence he was so wealthy, he’d have made Bill Gates’s wealth look like chump change. Realizing Nero’s instability, Seneca gave his wealth to the young emperor when he came of age and retired from political life. In Seneca’s last few years he wrote the letters to his friend Lucilius. They are filled with a mature wisdom that is even more apropos today then when it was written 2,000 years ago. Seneca was truly a man of the 21st century. He can teach you how to live today. There is no one book that has influenced my writing career. I find most writing books to be simply a rehash of stuff that has been rehashed a hundred times before and is all available for free on the internet now. Doyle’s story gave me a taste for the effectiveness of a feel of mystery, a bit of horror, and the effectiveness of a little humor. The Aiken and Saki stories demonstrated the importance of character. Lovecraft’s classic instilled in me the power of atmosphere. I read all four while in elementary school. I have never forgotten them and still see them as instructive examples of the writing art today. 7 – of yours that prospective readers should start with if they want to get to know your work and where they can get it. I’m a multi-genre guy. I read most everything (romance and gratuitous gore excepted) and I’m currently writing in four genres: post-apocalyptic (in the style of Earth Abides and The Day of the Triffids), mystery, alternative history, and horror. 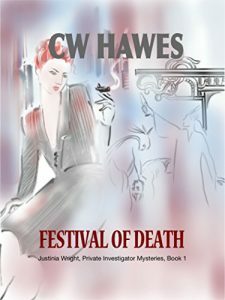 That said, I’d say a good starting book would be Festival of Death, the first book in the Justinia Wright Private Investigator Mysteries series. The reason I chose Festival of Death is because it contains a touch of horror, wonderful characters, humor, and unusual atmosphere. All the things I myself look for in a novel or story. The book can be found at Amazon and it’s only 99¢, or free with Kindle Unlimited. You can find CW at www.cwhawes.com and you can join his Reader’s Group to get in on free goodies and news about his many worlds. CW Hawes is a retired bureaucrat, having spent 30 years in Human Services. He knows a thing or two about the human condition, and about being human. He writes books that are thought provoking, laced with humor, are sometimes tongue in cheek or biting satire, and are always filled with characters who could be your relatives or neighbors. 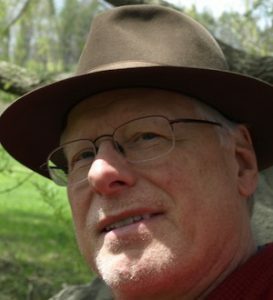 He’s written The Rocheport Saga (7 volumes and counting), the 5 book (and counting) Justinia Wright Private Investigator Mysteries series, the From the Files of Lady Dru Drummond alternative history series, as well as horror short stories of which 4 are currently available through Amazon. When he’s not writing, he can be found fiddling with his fountain pens (often with ink stained hands), cooking, or reading. Unless interrupted by his cat, or his pooky. Please note I am a participant in the Amazon Services LLC Associates Program, an affiliate advertising program designed to provide a means for sites to earn advertising fees by advertising and linking to Amazon sites.